Into the evening, Block Place in Melbourne, is bustling with people sitting at one of the cafes spilling into the laneway, and people passing by. 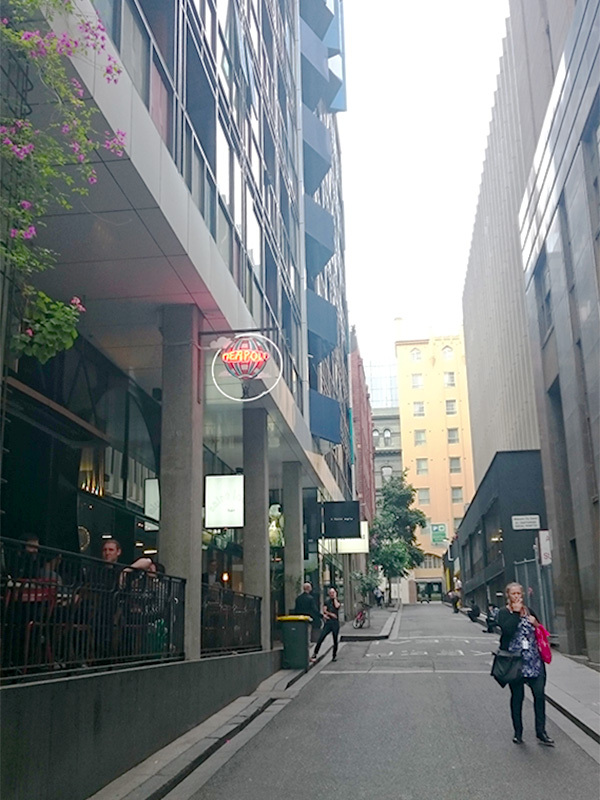 Article Note: This is the second installment of a two-part series on laneways. See Part 1 for background on efforts to enhance Melbourne’s laneway network including discussion of public realm initiatives. Melbourne, Australia is internationally renowned for its vibrant laneways, which are dotted with street-side dining, unique stores and residences, creating an intriguing maze of connections for people to wander and explore. Given growing interest in enhancing Seattle’s alleys as public spaces, the revitalization of Melbourne’s laneways provides an interesting example. Like Seattle, Melbourne made a conscious effort to invest in laneways — from 1994 to 2004, accessible and active laneways in central Melbourne increased from just 8 percent to 92 percent. Melbourne: Heritage character is celebrated in Rankins Lane. Photo by Sarah Oberklaid. 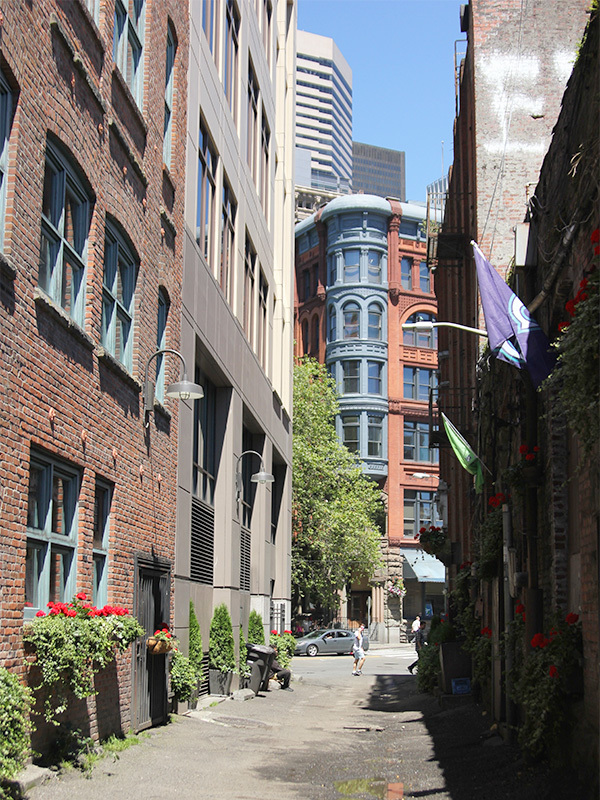 Seattle: An alley in Pioneer Square has charming historic buildings. Photo by Sarah Oberklaid. 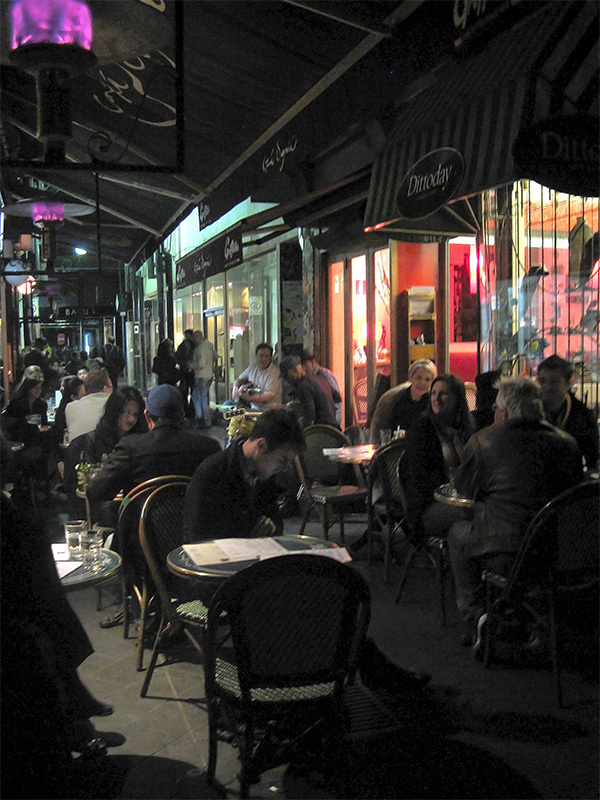 Melbourne: Into the evening, Block Place is bustling with people sitting at one of the cafes spilling into the laneway. Musicians contribute to the atmosphere. Photo by Sarah Oberklaid. Seattle: The Chophouse Row development in Capitol Hill provides a new alley connection with cafes and restaurants activating the space at different times of day. Photo by Sarah Oberklaid. As part of the broader initiative to regenerate the central city, a mix of uses and variety of development were promoted to activate streets and lanes. The City introduced the ‘Postcode 3000’ initiative in the 1990s, which sought to transform the stagnant business district into a 24-hour city by encouraging people to live in the center. The City provided a range of financial incentives, technical guidance, promotion, policy change and street level support to encourage residential development. A focus of these efforts was re-purposing and re-designing the oversupply of offices and vacant heritage buildings and warehouses for residential use. Melbourne: At this end of Russell Place apartments sit above a strip of retail spaces, offering a mix of boutiques, cafés and bars along the lane. Photo by Sarah Oberklaid. Seattle: Balconies addressing an alley in South Lake Union. Photo by Sarah Oberklaid. In 2001, the City introduced a Laneway Commissions Program, in which artists are encouraged to develop a work for a specific lane. Each year several artists are selected to create temporary pieces. The laneways also provide spaces for music events. The largest examples include the St Jerome’s Laneway Festival, which transformed several laneways into stages for a one-day music event each summer from 2005 to 2009 and White Night, an all-night free music and arts event which takes over the city’s lanes and streets for people’s enjoyment, which commenced in 2013. 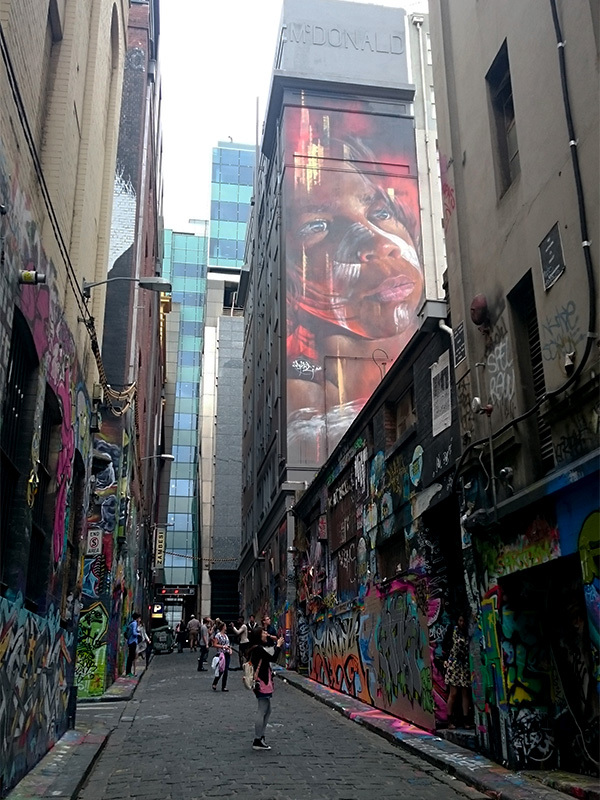 Art and cultural features support the laneways as a significant tourist attraction. Melbourne: Hoisier Lane is iconic for its street art which blends into a giant wall of color, trickling down to the uneven bluestone paving and wrapping to a connecting laneway. Photo by Sarah Oberklaid. 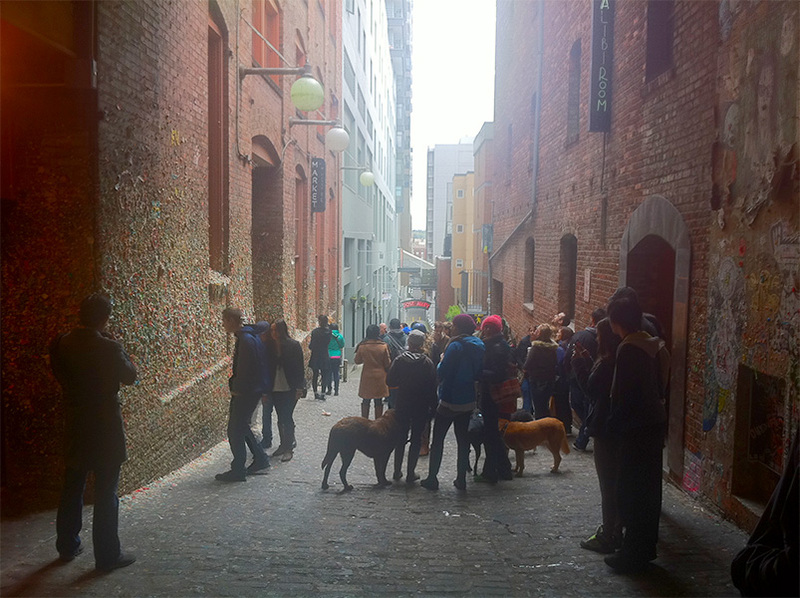 Seattle: The iconic Gum Wall makes Post Alley a tourist attraction. Photo by Sarah Oberklaid. Melbourne is one of the only cities in the world with a formal and longitudinal research program for collecting data on public life and pedestrian activity. In 1994, the City engaged Danish architect and urban designer, Jan Gehl, to conduct a groundbreaking study of the quality of public space and human activity in the central city. The study ‘Places for People’ repeated in 2004 and 2014 (the latter is due to be released), provides a database documenting pedestrian counts and behavior in relationship to features of the urban environment, including the location and type of public spaces, street and laneway connections, building form, business types, residential buildings, and street furniture. The research assists the City to understand the condition of the public realm, the impact of changes to the built environment on pedestrian activity, and prioritize work programs. Gehl’s reports have documented the impact of laneway revitalization on the way people use the city as well as identifying opportunities for their ongoing improvement. 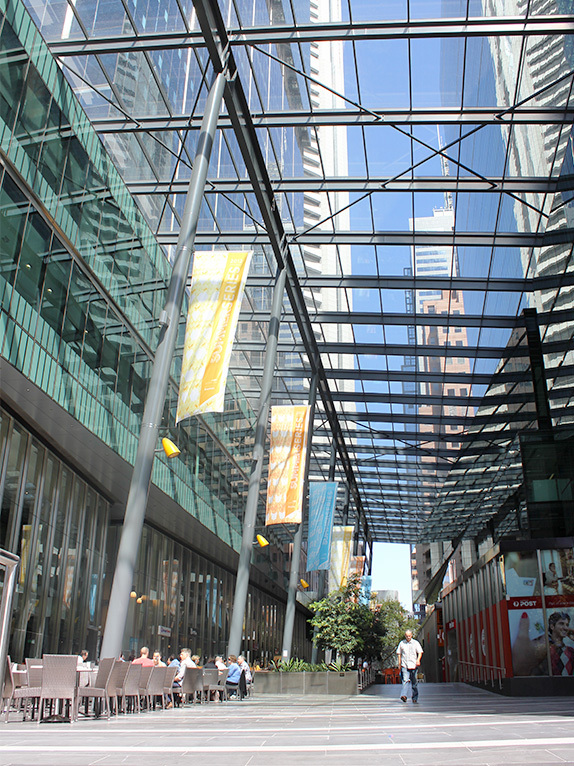 Melbourne: The Southern Cross Tower development incorporates a pedestrian connection through the block which references the city’s laneways. Photo by Sarah Oberklaid. 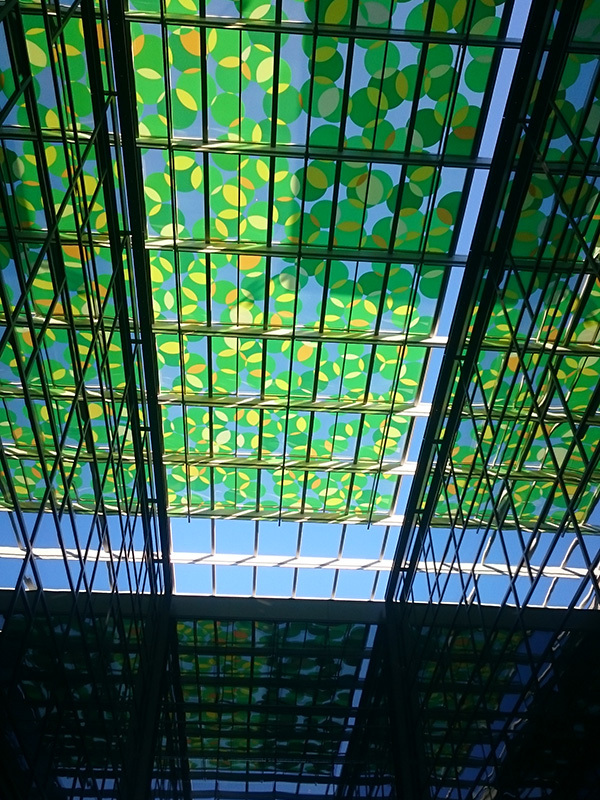 Seattle: An artwork by Spencer Finch is featured in the canopy above an alley in an Amazon building in South Lake Union. Photo by Sarah Oberklaid. With an estimated 844,000 people (the equivalent to one-fifth of the population of metropolitan Melbourne) visiting the central city everyday, laneways are an important public space asset. The revitalization of laneways has helped to repair missing links in the pedestrian network, providing unique routes to support increased walking activity. 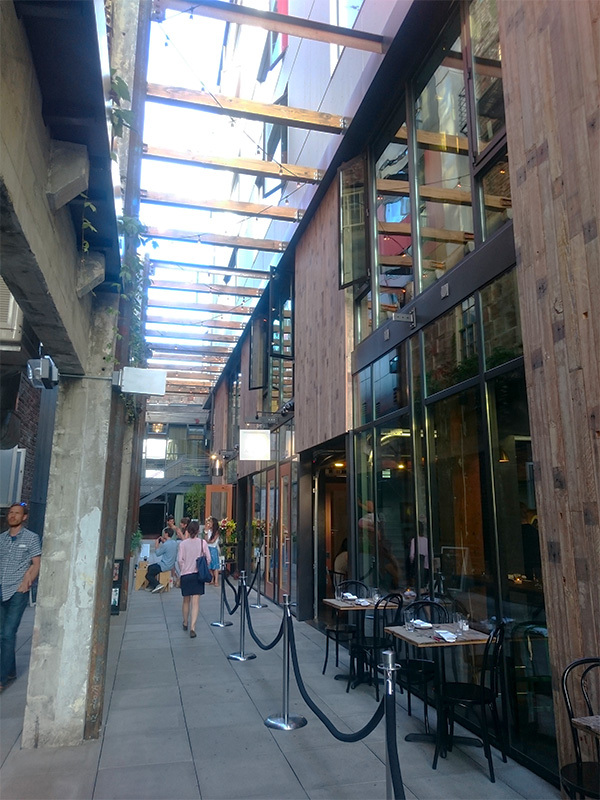 In Seattle, this revitalization has already begun, and with more residents choosing to live downtown, appreciation for the alleys as public spaces will grow. 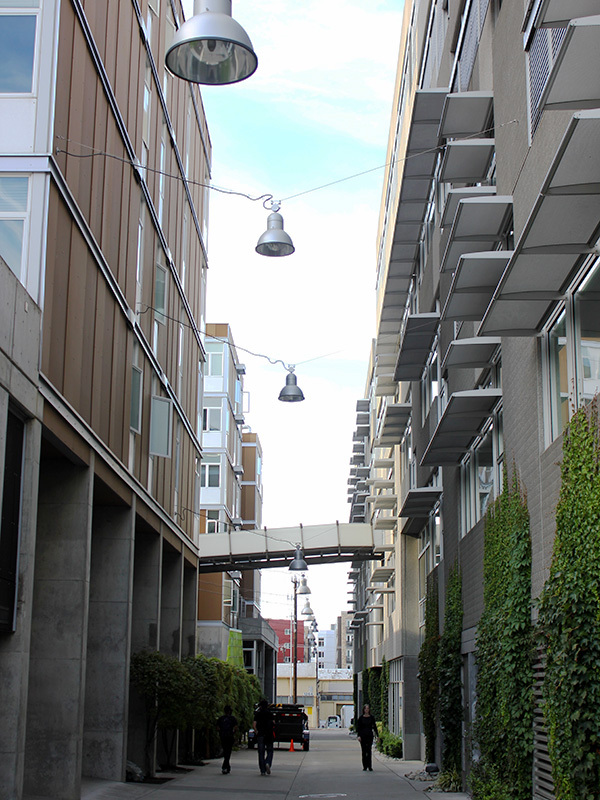 As in Melbourne, incremental and cumulative policy, urban design and programming efforts will be the key to making alley revitalization on a broader scale successful in Seattle. 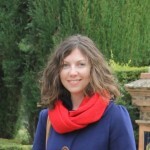 Great pair of articles Sarah, and mostly factually correct. I worked at the City of Melbourne from 1986 to 1996, and have consulted to it since. Please note that the 1994 Places for People study was done by the City of Melbourne, as were the next two. Jan Gehl contributed the methodology and oversaw the first one to ensure we could validly compare results with the work he had done in other cities. He also contributed an introductory essay to the first study. I led a team that did the 1994 study, and I wrote the report.